1. Slow Walkers. If you are a fast-pace walker, you would go absolutely crazy walking behind these people. They love taking their time and enjoying the scenery that surrounds them. This is probably a good thing, to be honest. 2. Siestas (Naps) are a MUST here. They have the weirdest open hours for their restaurants and shops. They usually open at 8 or 9 AM. Close from 3-5 PM. Open back up from 5 to 11 PM. Everyday they take a 30 minute nap after lunch then head back to work. That is probably why you never see a cranky Spaniard. 3. Be Blunt. If you want something just say “I want…” (Quiero in Spanish). Don’t say “Can I have…” (Puedo tener). They will just look at you and not understand what you are trying to ask. Just get straight to the point. 4. Short and Sweet. When you are in a grocery line or buying something from a store, don’t ask how they are doing because they won’t answer. Just say “Hola”. I made the mistake of saying “Hola! Como estas?” and she looked at me like I was crazy. 5. Padded Shoes are a Necessity. This trip I made the mistake of not bringing comfy shoes. I found out the reason why these people that live here are so skinny even though they eat carbs constantly (bread for days) … they literally walk around 6 to 8 miles a day (no joke). I am pretty sure they have more ice cream shops than restaurants here, so if that explains all the walking they must do. 6. Minerals in Their Water. I am convinced that there is something in Spain’s water. Every single person I pass on my way to school (30 minutes by the way) is gorgeous! I don’t think I have ever seen so many pretty people in one place. Every guy looks like Mario Lopez, while the women look like Penelope Cruz. 7. Crowded Streets. Like I said earlier, they walk everywhere. The streets here are so confusing and driving a car would take you longer than walking because of all the cut off streets due to the trolley. They also have bike lanes that are bigger than the walking lanes. 8. What Street Signs? They don’t have any street signs here! There may be a sign on a building telling you the street you are on…if you are lucky. 9. Rules Schmulessss. I’ve noticed a great deal of rules/regulations being laid back here. I have only seen one police involved incident and that was because a man was selling knock-off purses on the side of the street. 10. Cooking is Life! The mothers here are very dedicated to their house and cooking. They start cooking lunch around 10 AM when it is served at 2 and dinner at 6 PM when it is served at 9:30. So you probably think it would be very nice to ask your mom if you could help with dinner. Here that screams, “Your cooking is disgusting!” They feel as if you are making a hidden comment that you are helping because their food isn’t good enough. So never ask to help with dinner whatever you do! 11. Expressing Yourself. Everyday I walk home from school around 8 PM and there are performers everywhere doing the flamenco dance, singing and playing guitar, and dressing in weird costumes. It is actually pretty exhilarating to figure out what I will see that night on the way home. 12. 5 Minute Showers. This is one thing I had to adjust to which was kind of a struggle. Since it never rains here, they have hardly any water meaning you can only have a warm shower for maybe 5 minutes then you turn into an ice cube. 13. “Great Job! You Got a 68%!”. Don’t expect to get higher than an 85% here unless your name is Albert Einstein. The teachers pretty much tell you straight up you will never get a 90%. This is another adjustment that has been taking a toll on me. To them, a 80% is like an A back in the States. 14. Jeans are The New Shorts. It is 100 degree weather here and I see 80% of people wearing jean pants! I am really confused about how they are not dying from a heat stroke. My teacher told me that apparently Levis cost 90 euros while in the US they cost maybe $60. I told him I would ship him a pair if he gives me an A… so we’ll see. 15. Taxes Spent Right. Before I tell you how much their income tax is, I want you to look at my photos of all the beautiful landscapes and buildings there are here. Okay…. so their income tax is 50%! Crazy I know! But here they don’t have insurance, instead their tax dollars pay for public healthcare and the parks/landscapes. Even though that sounds outrageous, my professor said that many of the people don’t mind it because they feel like they get so much back in return. **This experience has taught me a lot… if you haven’t noticed. Even though it is a different culture, I still love every single aspect about this beautiful country! 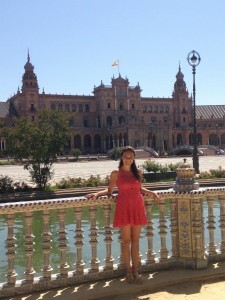 If you ever have the opportunity to study abroad, GO TO SEVILLA! This city is unbelievable! Long time no post! I need to catch you all up on how amazing my experience has been so far! Let me start off by saying, out of all the places I have been to thus far, Sevilla is my favorite city. The city has so much to offer such as the architecture, landscapes, plazas, and people! I walk 30 minutes to class everyday, but it doesn’t feel like that long because of how beautiful my walk is. Universidad Internacional Menendez Pelayo, my school, has the best resources. The staff and utilities have made me feel so comfortable for being in a country that speaks Spanish with a little bit of English. 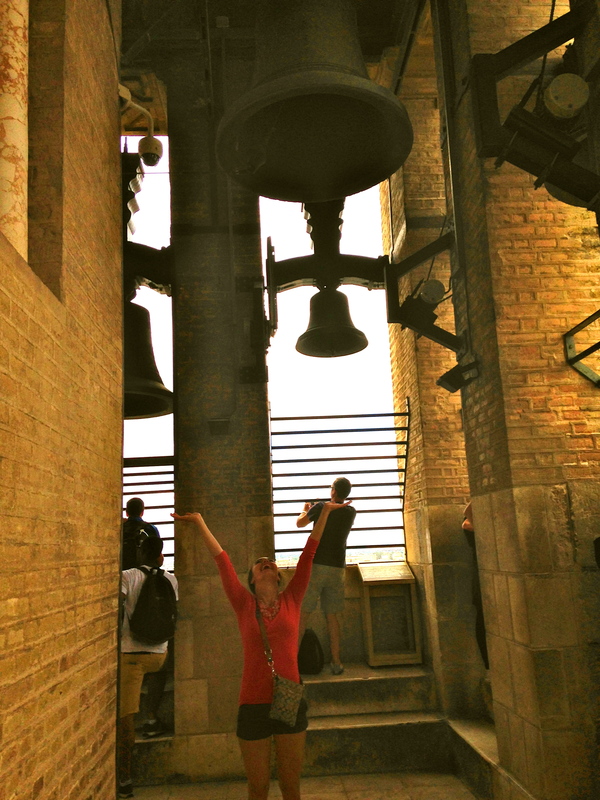 Speaking of Spanish… my Spanish has become soooo much better from being here. 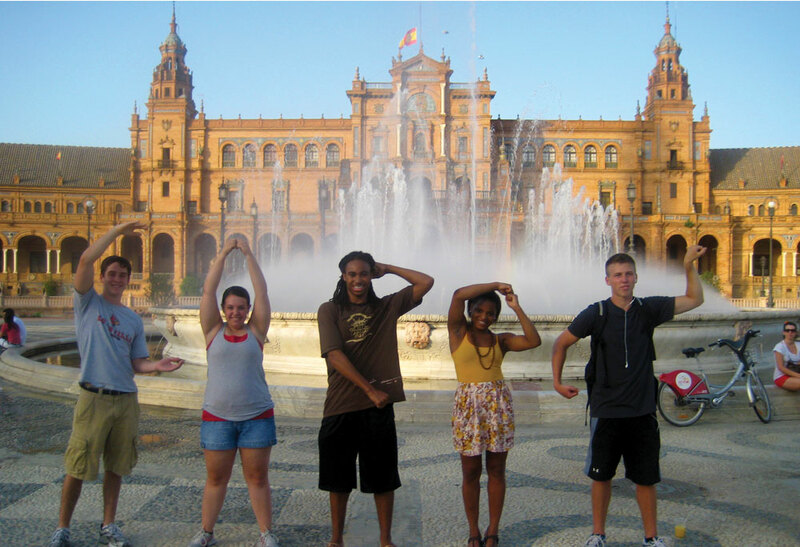 If you are a Spanish major or minor, Sevilla is the place to go! They use the dialect that we learn back in the States, which is very helpful. But anyways, I bet you want to hear about my experiences so far. 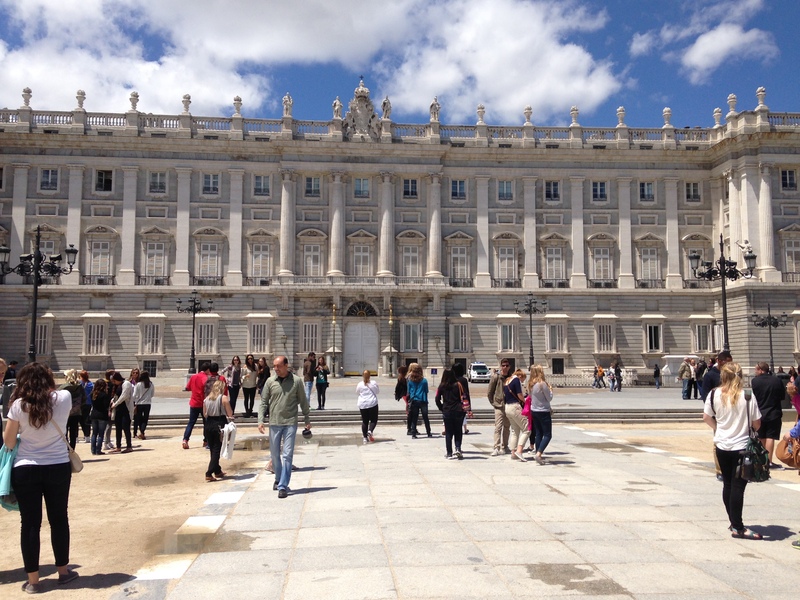 I have traveled to Madrid, Toledo, Malaga, Granada, Cordoba, Jerez, Cadiz, Morocco, and Sevilla in only 4 weeks! 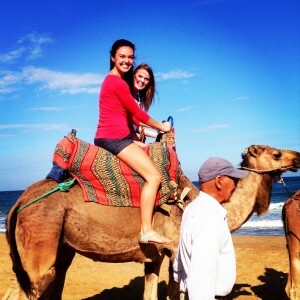 ISA gives you all these opportunities to travel on excursions throughout the program. 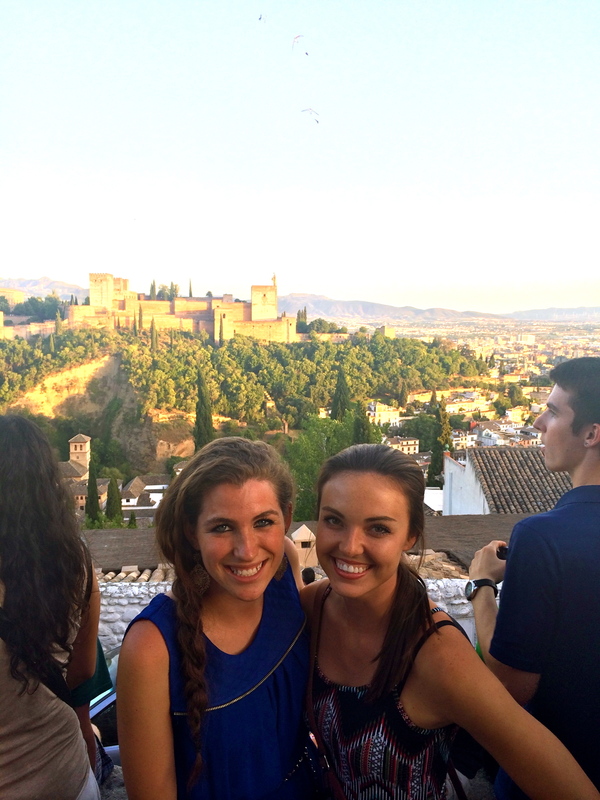 While being in Granada, we were able to see the biggest Mezquita (mosque) in the world! The mosque is beautiful! We learned that the Catholics took over the mosque and put a church right in the middle of the praying grounds. We headed to Granada right after. In Granada, we were able to see a Flamenco dance. The neat thing about Granada is you get free tapas (appetizers) when you order a drink. So in all reality, you don’t have to buy food if you don’t want to. We also were able to see a garden/fortress called La Alhambra. Beautiful scenery! 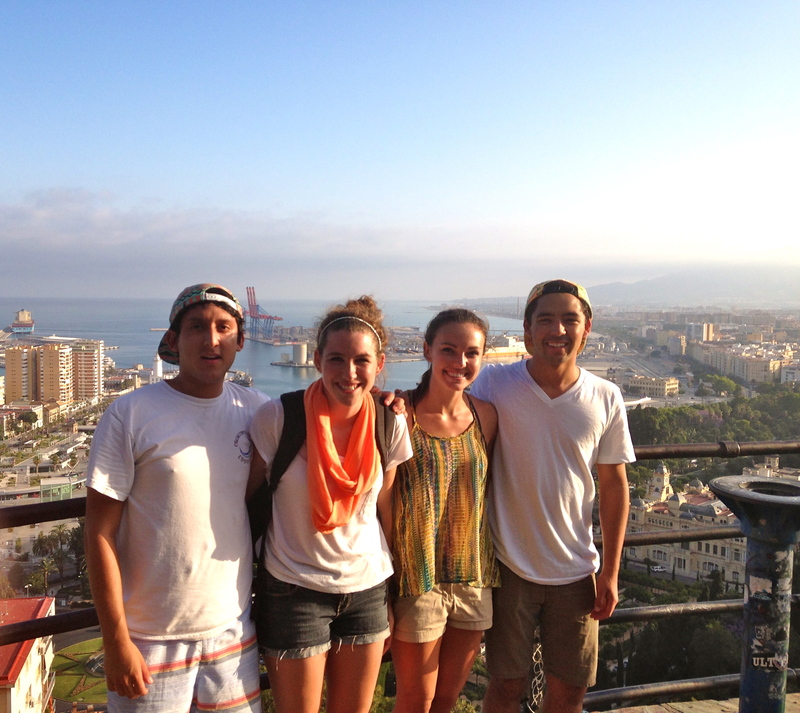 One of the places I went with just a few friends was Málaga. 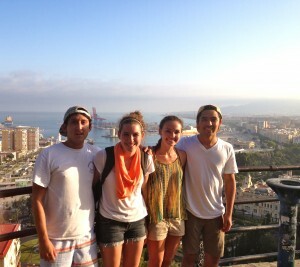 I traveled with my new friends Monica, Jaffet, and Austin. We decided to adventurous and go to the beach and spend the night on the beach instead of getting a hostel. We actually could have done that if it didn’t downpour while we were there. It was still an experience I wouldn’t take back. The more, the merrier my mom always says. The next weekend, we traveled to Jerez and Cadiz. In Jerez, we went to a winery and learned how they barreled the wines and developed the rich taste. We also were given the opportunity to taste test 2 wines called Tío Pepe and Croft. They were both sweet wine wines (my favorite!). At Cadiz, we found a beach to relax at for 4 hours. The beach was extremely crowded because in Spain everybody travels to the beach in June, July, and August on the weekends. This past weekend, I decided to travel to Morocco as a personal trip of mine. I went with Remy, Austin, Madison, and Thomas from my ISA group. 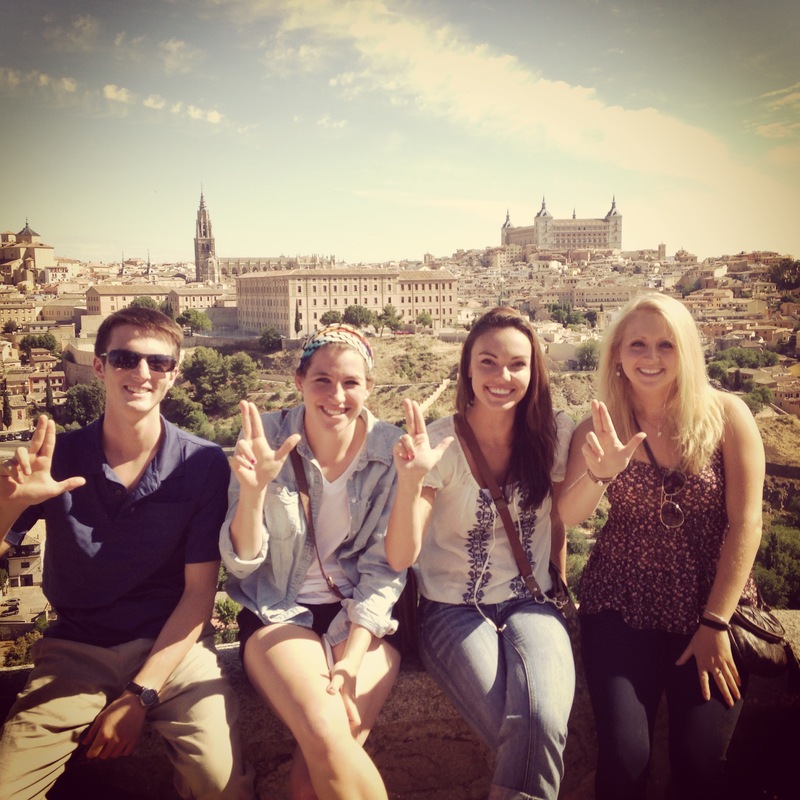 We went through a program called We Love Sevilla. We paid $298 for a 3 day trip that included 2 hotel rooms, 6 meals, camelback rides, monkey interactions, cave viewing, 3 tours (bus, walking), travel there and back (bus, ferry), and a belly dancer show. It is crazy how cheap it was! They have an excursion that goes to Portugal that I am going to look into as well. But anyways, this was probably my favorite excursion so far because of all the things we got to experience. I don’t think I would ever go back to Morocco since it was pretty poverty-stricken, but it was still neat to engage myself in the culture and people. All of Northern Africa is Arabic, which I had no clue about. So you can imagine how surprised I was when I got there! 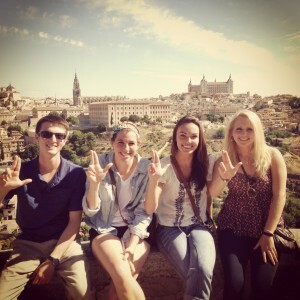 This week is the last week of Session 1 of my study abroad. I still have one more session, but it is sad to see all my new friends leave. It will definitely be an adjustment, but I can’t wait to meet the new group coming! My time here is half way over and it amazes me how fast this amazing experience goes by. I wouldn’t trade this opportunity for the world! So lucky to be able to do this! I recommend anybody interested in studying abroad to start saving now because it is worth every penny! PS- I added a video link below. My friend, Austin, made this of our experiences we’ve had so far! Enjoy! I want to share with you my journey in Sevilla, Spain thus far. This place is absolutely amazing! I wish I could post all my pictures on here, but that could get obnoxious. I just got here 3 days ago and started class 2 days ago. I am taking International Finance and Advanced Spanish Culture and Civilization. My new friends and professors are so nice and down-to-earth. I also decided to join a volunteer program where I will spend time with the elderly at the nursing home next door to my school. I am starting to get a grasp on where everything is. I live downtown in Sevilla, 5 minutes away from the 3rd largest cathedral in the world. Today we went on a tour there and it was one of the most beautiful places I have ever seen. 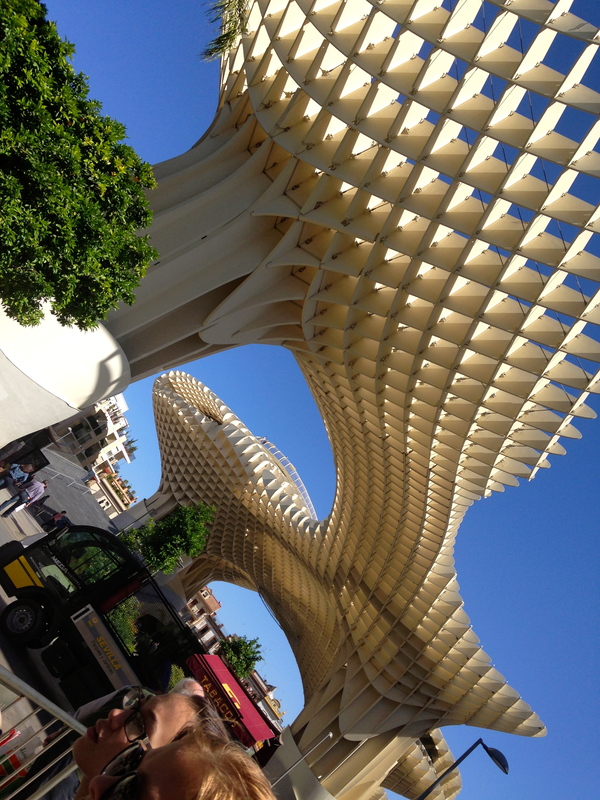 The architecture in Sevilla is filled with curves and arches. There is not one boring building. There is so much color here. My suggestions to go to any of you ever wanting to go to Sevilla are Plaza de España, Las Setas, Plato de sabado, Universidad de Sevilla, Parque de Prado, and the cathedral. When I see more of the city, I will let you know what else there is to see. I can’t explain to you how amazing this experience has been so far. I am so thankful for all of you who have helped me along the way. You truly are making my dreams come true. I am glad I can say I studied abroad because of the University of Louisville’s College of Business, my friends, and family. Your support means the world to me! I will keep you updated on my new experiences and excursions throughout these next two months!